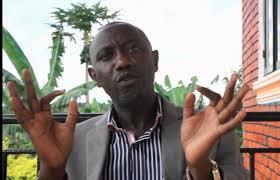 Lwengo District chairman George Mutabaazi has today been dragged out of a RwandAir plane over alleged drunkardness and failure to adhere to orders. Mr Mutabaazi came into the spotlight after he was captured on camera whipping residents at the launch of a community cleaning exercise in Lwengo a few years ago. In a video that has gone viral on social media platforms Mutabazi is heard asking his ‘captors’ what he had done to deserve such treatment. A source intimated to PML Daily that Mr Mutabazi who was allegedly too drunk by the time he was ejected out of the plane like a chicken thief insisted on sitting in the business class yet he possessed an economy ticket. He allegedly refused to vacate as advised because of his stupor condition. This prompted security personnel at the airport to drag him out of the plane.According to authorities at the airport, Mr Mutabazi will resume his journey after sobering up.